The HISCEC Foundation and the Hispanic Chamber of E-Commerce invite you to the first event of a series of events under the "HISCEC STARTUP SERIES" program. 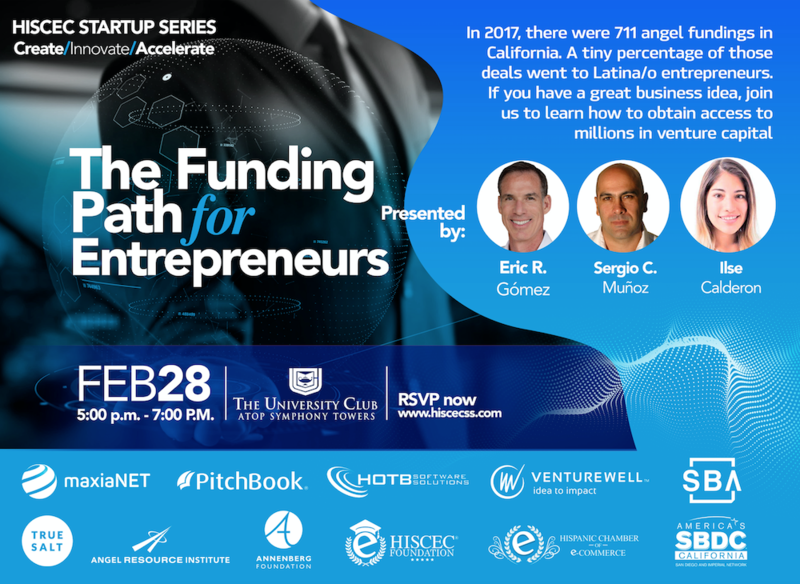 Join us on February 28, 2019, at the University Club in San Diego. UNLIMITED BEER, WINE & SOFT DRINKS FROM 5:00 – 6:00 P.M. AND A TACO STATION FOR SNACKS. In 2017, there were 711 angel fundings in California. A tiny percentage of those deals went to Latina/o entrepreneurs. If you have a great business idea, join us to learn how to obtain access to millions in venture capital. The 2017 HALO Report notes a continuing trend of geographic dispersion of angel groups investing outside of their headquarter states; the sustained (though narrowing) dominance of both software and healthcare IT as angels’ preferred investment sector; an increased ratio of initial investments versus follow-on financing rounds; an increase in the number of deals funded where female entrepreneur(s) also have founder status; consistency in deal structures, with a noted increase in the use of convertible notes for first-time investments; and a slight decline in the valuations companies received from angel groups. – Why do Angels exist? – When am I investor-ready and how do I find my lead angel? ADMISSION INCLUDES UNLIMITED BEER, WINE & SOFT DRINKS FROM 5:00 – 6:00 P.M. AND A TIJUANA TACO STATION FOR FOOD.